Tweet was conceived from the desire of creating a rational piece of furniture suitable to be placed even in the most characteristic spaces, respecting their style. A distinctive feature is the thin polypropylene shell that offers a high comfort thanks to the bi-injection moulding technology. The frontal rounded shell in matt finish, in contrast to the glossy surface of the back, evokes a soft upholstered seating. 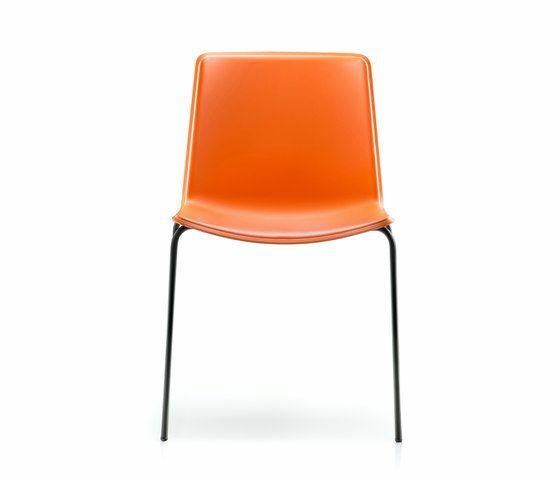 The outline of the backside shell makes the chair easy to handle and gives a three-dimensional look. Materials and Technologies: bi- injection moulded polypropylene. Steel tube frame Ø 14mm. Finishes: glossy finish on the back of the shell, matt and scratch resistant on the front side. Colours: one-color version in white, black, beige, orange. Two-colours version with white front and back side in black, grey, beige, yellow or red. Frame in chrome or powder coated.